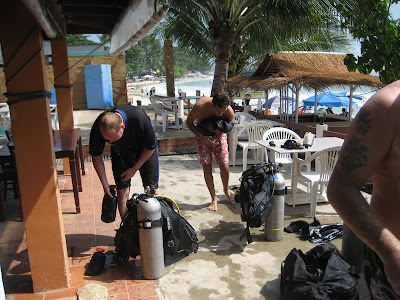 The December IDC finished and the PADI IE has started today on Koh Tao. All four IDC candidates, Will, Sophia, Rob and Joakim have successfully completed their IDC course and Paul and Miro both succeeded in their IDCS courses. Here are Joakim and Will after their Open Water dive of the OWSI program. It was a lot sunnier than during the last IDC and temperatures in general were very nice. For more Samui weather information, please visit my Samui weather blog. Miro, Rob and Sophia are in this picture putting their dive equipment apart, after their Open Water dive during the IDC. 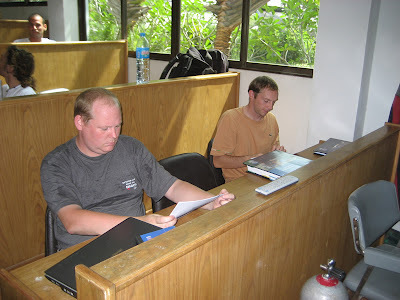 Today the PADI IE started, the examination! Here are Will and Sophia looking at their assignments for their IE program. Thomas Knedlik on the left will be their examiner. Joakim and Rob checking out their assignments. Before the IE, there was a lot of nervousness and anxiety floating around, which probably won't finish until they complete the program on Thursday! 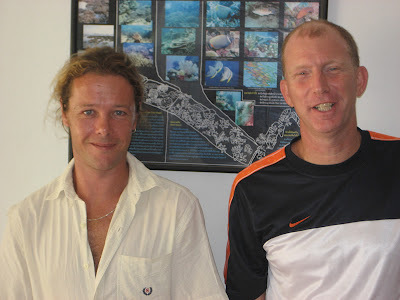 Here's a picture of me and Bob Murphy, our brand new PADI Course Director of our Koh Tao dive center, Planet Scuba. He did send his candidates to this IE as well. Keep tuned until Thursday to see how they did!